Raise a mug at a traditional California tavern. 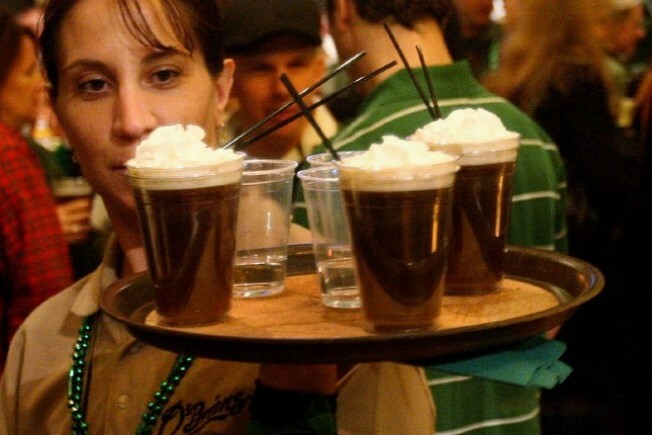 Whiskey, coffee, and clouds of whipped cream; the Irish Coffee is one heavenly bev. Simple things are best, mother always said (pretty much anybody's mother, we're guessing), and there are few drinks simpler than an Irish Coffee. Forget glow-in-the-dark ingredients, fancy flower waters, and sugar cubes imported from a special sugar cube farm in Northern Oregon. An Irish Coffee is just coffee -- no surprise there -- whipped cream, sugar and whiskey, preferably something like Jameson's. Done. Sure, you can throw in a shot of Bailey's or add a bit of nutmeg-ish flavor to the whipped cream, but if have those four basic things, plus a pretty glass mug and stirrer, you're set. In LA, of course, when we crave this warm-the-cockles sip, we turn to Tom Bergin's Tavern, the House of Irish Coffee (the old-fashioned sign out front touts this, in fact). There's nothing more comforting on a June Gloom-y day then a small, steam-y mug at Tom's, just to get the blood going. And on St. Patrick's Day, we'll often go with this sweet drink over the usual beer. We're also fond of the Buena Vista in San Francisco, which definitely draws tourists by the busload, and has for decades. Doesn't matter. We'll wait semi-patiently at the counter for our chance to have the nicest nightcap in that foggy burg. Wards off chills, Irish Coffee does, and with a bang to boot. If Tom Bergin's or the Buena Vista aren't nearby, however, an Irish Coffee is a snap to make at home; again, it's coffee, whiskey, whipped cream and a dash of sugar. Just have a book of Irish sonnets nearby, or at least all the "Father Ted" shows on DVD. Cheers!